Shortly after George Steinbrenner’s death in 2010, talk began to sweep across social media about his worthiness for inclusion in the Baseball Hall of Fame. Ruppert did at last find enshrinement in 2013, and George Steinbrenner’s name was back on the ballot for 2014. All was in order, although he fell well short of election. You could not work for the Yankees without thinking about the history of the franchise on a daily basis. Babe Ruth was everywhere. Young fans today don’t care as much about baseball history as their preceding generations did, but there is no escaping Ruth. And 90 years ago, there was no escaping Ruth if you were Jacob Ruppert or Miller Huggins. Ruth was oversized in every way – the easiest to pick out of team photo, and the one most likely to be in the newsreels at your movie theater. But the dynamics of Ruth and Ruppert, Ruth and Huggins, Huggins and Ruppert (over matters concerning Babe) require a book like this to sort it all out. This would have likely made Huggins laugh. Babe in fact, seemed to have made a career out of making Miller’s life miserable. His propensity to circumvent rules was forever a bane to Huggins, who tried so hard to impose discipline on the Yankees. It was what managers did! But it just could not be accomplished with Babe laughing at the rules and getting into mischief like your worst junior high school detention-ridden malcontent. There would in fact, be few enforceable rules that applied to everyone until Babe left the Yankees after 1934. And by then, poor Hug was long gone. And then there was the conflict between Babe and Ruppert. At least Babe knew who signed his paychecks, and who he had to at least show the same respect he had shown to his elders at St. Mary’s. But yes, he wanted to manage the Yankees. And in a time when player-managers were common, (usually to save a salary), he was feeling ready by the time Huggins died. Ruppert decided then that Babe was not managerial material. So he shot him down in 1930, and then after Bob Shawkey was fired after one year, he shot him down again in 1931 when Joe McCarthy got the job. And when McCarthy didn’t win in ’31, Babe was probably campaigning again. And he did not get it, not in ’31, and not between 1933-35 when the Yankees failed to win the pennant. “C’mon, Colonel,” he probably said. “Sorry, Root,” was the almost annual response. The request to manage probably coincided with Christmas season. You could cast Scrooge and Cratchit in the parts of Ruppert and Ruth. I’m not sure what kept Ruppert out of the Hall of Fame for so long, other than a long stretch in which owners simply weren’t considered. Most of them simply “owned,” and didn’t run things, as Ed Barrow did during the Ruppert years. I do know that I always felt that a Ruppert plaque would have been an easy one – Bought Babe Ruth, Built Yankee Stadium, Created Yankee Dynasty. But of course, as we see in this book, there was a lot more to the man than sitting back and watching those first inning leads grow. He knew how to live the life of a man of wealth. His homes and estates, his hobbies, his refined tastes, were all pure 20th century, inherited from European opulence which his parents would have seen, and Americanized in the nation’s most vibrant city. It was not smooth sailing for Jake, of course. The money and the homes and the servants and the horses and the show dogs and the rest were all fine. But he did also have to live his very public life in the wake of anti-German feelings following World War I (The Great War), owning a brewery during Prohibition (put THAT in your business plan), and then his mighty Yankees had to be reigned in during the Great Depression that essentially crippled the growth of the baseball industry. So it wasn’t just sitting back and watching the runs score. It was staying afloat while maintaining a smile. I wish I knew the “mystery lady,” Helen “Winnie” Weyant, the Colonel’s regular companion, to whom he left a third of the Yankees. I could have known her – she lived not far from me in Westchester County, New York, and she lived into the 1980s. But she receded from whatever small spotlight she occupied and apparently chose a life of reclusiveness. There were no obituaries for her when she passed. What an interesting Old Timers Day guest she might have been. I did know Dan Daniel near the end of his life, but I did not know that he had done some work with Col. Ruppert on a memoir. What a gift to baseball that would have been! What a missing link to know the whole story behind everything from the purchase of the team to the hiring of Huggins to the acquisition of Carl Mays to the Ruth deal to the Stadium construction and onward. We could certainly have used a Huggins memoir too. Or one from his sister, revealing what he REALLY thought of Babe Ruth when he unburdened himself in the evenings. But now, in this volume, a lot of those moments are carefully reviewed through the eyes of baseball historians and put into perspective. We didn’t get the first hand accounts of Jake or of Hug, but this book fills the gap quite well. 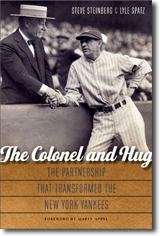 Ruppert and Huggins were the principal figures in the transition of the Yankees from an afterthought on the New York baseball scene to the nation’s greatest sports dynasty of the 20th century. And they are well served here.